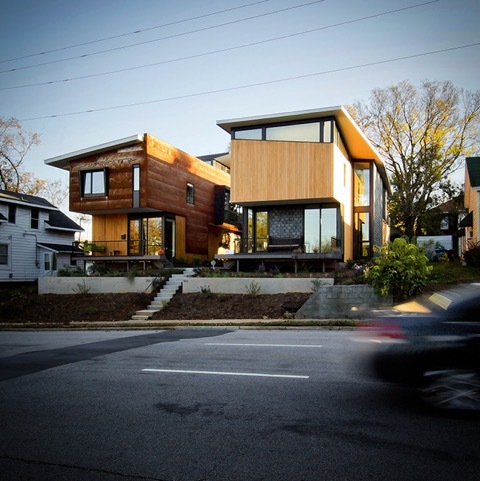 The Raleigh Architecture Company is an award-winning design-build firm specializing in Modern sustainable architecture, and craftsman-quality construction. As licensed architects and general contractors, we consider designing and building to be one integrated process. This streamlined approach empowers us to meet our clients’ economic expectations and to seamlessly execute high quality details, both small and large. Our office and shop are located under one roof in downtown Raleigh’s Warehouse District at 502 S. West Street. For more information visit www.raleigh-architecture.com, call 919-831-2995, or email: info@raleigh-architecture.com. Activate 14, a community outreach initiative of the American Institute of Architects’ North Carolina chapter (AIA NC), will host a 3D Printing Seminar and Open House on Thursday, April 16th, from 4-7 p.m., at the AIA NC Center for Architecture & Design, 14 East Peace Street, in downtown Raleigh. The event is free and open to the public, but participants are asked to RSVP at activate14.eventbrite.com. During the open house, architects, designers, and professors will share their applications of additive manufacturing, better known as 3D printing. Models and a maker-bot will be on hand for viewing and demonstrations. Jay Smith, AIA, of Duda Paine Architects in Durham. Architects in attendance may receive one HSW Continuing Education credit. This event is part of Activate 14’s ongoing mission to strengthen the civic role of architecture and design in the community. For more information and to keep up with future events, visit activate14.com. Promote the Center for Architecture and Design as a public resource. Engage architects, artists and designers in exploring “big picture” questions. Convene the public around environmental and social issues. Each event is a call-to-action for those interested in building community. Events are designed to empower people to make a difference in shaping the world around them. Visit activate14.com and follow on Facebook at www.facebook.com/activate14. September 22, 2011 (Raleigh, NC) – Umicore Building Products USA (UBP), headquartered in Raleigh, NC, has donated $70,000 worth of PIGMENTO® Red VMZ standing-seam zinc panels to be used for the roof of the American Institute of Architects North Carolina Chapter’s new, modern, sustainable headquarters building that is now under construction in downtown Raleigh. “We are proud to be a supporting member of the AIA NC building. It is wonderful to be a part of such an important project in our own backyard,” said Daniel Nicely, an associate member of the AIA and UBP’s Director of Market Development. Officially named the AIA NC Center for Architecture and Design, the building was designed by Frank Harmon Architect PA of Raleigh, a multi-award-winning firm well known for its modern, green, regionally appropriate design. 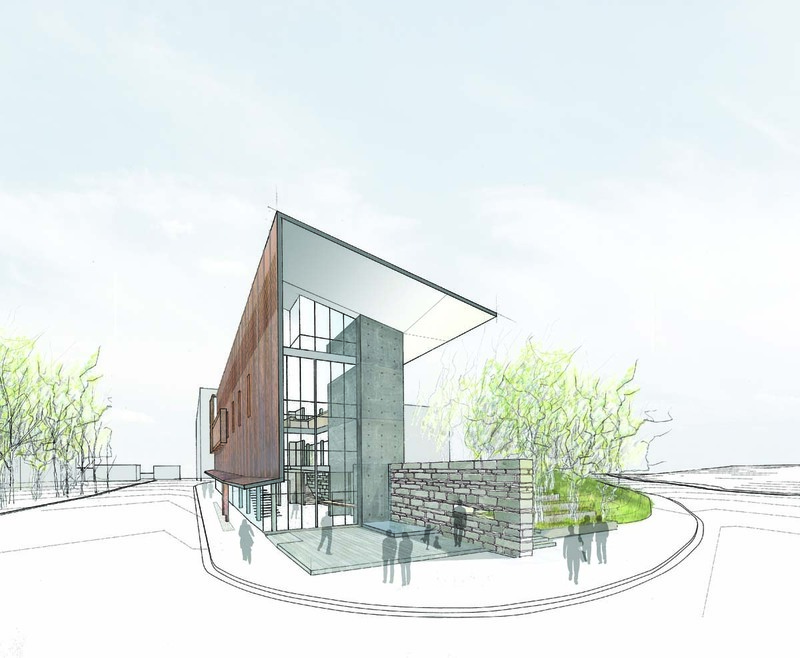 Under the direction of principal Frank Harmon, FAIA, the firm won a professional design competition for the project. The design competition required submissions to be as “green,” or environmentally sustainable, as possible. Among the building’s many eco-friendly features will be the zinc roof. 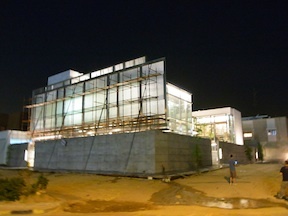 The new building’s other green features include: careful siting, extensive use of glass, operable windows, and open porches to maximize natural lighting and ventilation; a geothermal heating and cooling system; an underground rainwater collection cistern, the use of locally available and recycled materials wherever possible; a broad roof overhang to protect the interior from harsh summer sun; a special energy-conserving elevator; and an innovative parking “garden” comprised of porous paving that will eliminate all storm water run-off. The red pigment in the PIGMENTO® Red panel is created through a factory process that adds the red pigment to the coil during the manufacturing of the sheets and coils. The advantage of adding the pigment during manufacturing is that the panel will not require any reapplication of color, and the color will weather evenly and smoothly as it ages. VMZINC is recognized for blending well and easily with other architectural products, such as the AIA NC Center’s wood siding (cypress), stonework, concrete, steel, and glass. For more information on UBP and VMZ PIGMENTO® Red products, visit www.vmzinc-us.com. About Umicore Building Products USA, Inc.
Umicore is a world-leading producer of architectural zinc. For over 160 years, Umicore has been providing innovative solutions for building owners, architects and contractors. Umicore has offices and representatives all over the world. In the United States, Umicore Building Products USA, Inc., is based in Raleigh, NC. For additional information, visit www.vmzinc-us.com. September 15, 2011 (Raleigh, NC) – Frank Harmon Architect PA has received a 2011 Honor Award from the North Carolina Chapter of the American Institute of Architects (AIA NC) for the firm’s design of North Carolina State University’s JC Raulston Arboretum Lath House in Raleigh. The Lath House received one of only two Honor Awards presented this year, and it was a pro bono project for Harmon’s firm as a gift to the Arboretum. The Lath House is an open-air laboratory for horticultural research. Its screen of wood two-by-twos fulfills the specific light-to-shade ratio young plants need before they transition into the larger gardens. According to the firm’s principal, Frank Harmon, FAIA, the structure was designed as an abstract of a tree that spreads its branches to protect the plants. The Lath House replaced an older structure that sheltered approximately 700 young and tender plants that perform best in shade. 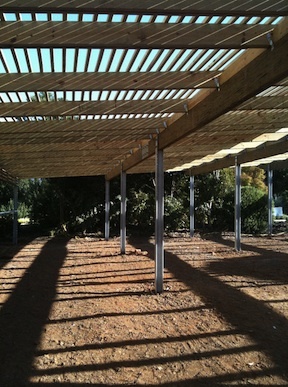 The new structure may provide space for 1000 new plantings. The 10 and a half-acre JC Raulston Arboretum is a nationally acclaimed garden with one of the largest and most diverse collections of plants, shrubs and trees adapted for use in Southeastern landscapes from over 50 different countries. Plants are collected and evaluated in an effort to find superior plants for use in southern gardens. 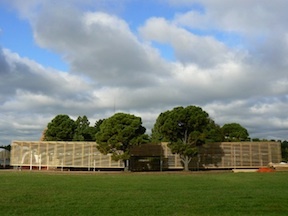 The Lath House is a key element in the arboretum’s work. Will Lambeth, a former member of Harmon’s design team who left to attend Harvard University, served on the design team for the Lath House, which received a Merit Award this summer from the Triangle section of AIA NC and has been published at ArchDaily.com. Harmon’s firm is known for designing projects that celebrate plant life, such as the cluster of buildings for the NC Botanical Gardens Visitors Education Center at the University of North Carolina at Chapel Hill, the Walnut Creek Wetlands Education Center in Raleigh, and the NC Museum of Natural Science’s open-air classroom at the Prairie Ridge Eco-station, also in Raleigh. For more information visit www.frankharmon.com. Frank Harmon Architect PA is an award-winning architectural firm located in Raleigh, NC, and recognized nationally as a leader in modern, innovative, sustainable and regionally appropriate design. For the third consecutive year, the firm is ranked as one of the Top 50 Firms in the nation by Architect magazine, and Frank Harmon, FAIA, founder and principal, was included in Residential Architect’s recent “RA 50: The short list of architects we love.” The firm’s work has been featured in numerous books, magazines, journals and online magazines on architecture, including ArchDaily.com, Dwell, Architectural Record, Architect, and Residential Architect. For more information, go to www.frankharmon.com. Future residence is a secluded retreat within an established neighborhood. 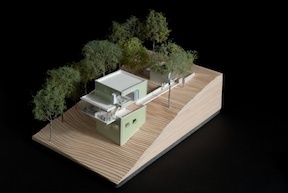 Architectural model of the award-winning Jones Residence II. September 14, 2011 (Raleigh, NC) – An as-yet-unbuilt residential “tower” designed by Kenneth E. Hobgood Architects in Raleigh has received a Merit Award from the North Carolina Chapter of the American Institute of Architects (AIA NC). 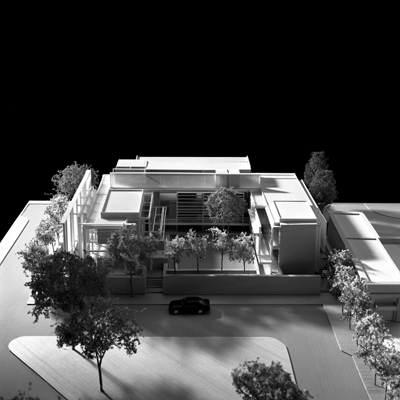 The winning design, “Jones Residence II,” is one of two concepts the firm has proposed for the same client and site. Located on a steep, heavily wooded site just inside the beltline in Raleigh, North Carolina, this concept is an 1800-square-foot home that balances the client’s’ desire to be part of a well-established neighborhood while yet feel as if they’re in a secluded retreat. The house becomes, then, a three-level tower that minimizes disruption to the site. In fact, it’s footprint covers only 1.25 percent of the site and would result in the loss of only two trees. While all three levels are simple square plans, the middle level has been shifted forward, allowing dramatic views of the site and creating outdoor balconies. This level, clad completely in glass, contains the entrance, living room, dining room and office. The main entrance is reached via a bridge that spans from a parking terrace to the living/dining level. The lowest level includes two guest bedrooms, the upper level houses the master bedroom suite, and a continuous stair connects all three levels. So the day-to-day living in the house occurs on the two upper levels. The design team for Jones Residence II consisted of Kenneth Hobgood, Paul Hobgood, and Patrick Hobgood. Tom Pfeiffer, FAIA, and Craig Dykers, AIA, served as chairman of the 2011 AIA NC Design Awards jury. (Pfeifer designed the new NC Museum of Art.) Other notable architects from the New York area, where the jury met, served as jurors. The awards were presented during the AIA NC Annual Conference held this past weekend in Raleigh, NC. For more information on Kenneth E. Hobgood Architects, visit www.kennethhobgood.com. 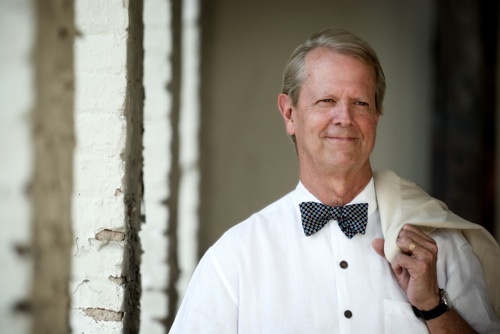 February 18, 2011 (Raleigh, NC) — Frank Harmon, FAIA, principal of Frank Harmon Architects PA in Raleigh, will be the featured speaker for the Wright Lecture Series in Madison, Wisconsin, on March 10, beginning 7 p.m. in the Monona Terrace Community & Convention Center. 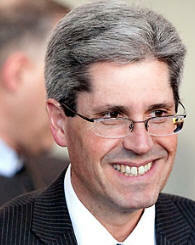 Harmon will also serve as a juror for the AIA Wisconsin Design Awards program. Frank Harmon is a multi-award-winning leader in modern, innovative, sustainable, and regionally appropriate architecture, and he frequently lectures on the subject “Place Making: America’s New Regionalism.” The AIA Wisconsin lecture will follow a similar presentation he is making at the Dalhousie University School of Architecture in Nova Scotia on February 28. Both lectures will discuss how regional architecture can produce high-performance, or sustainable, buildings by addressing context, materials, textures, colors and form particular to the region in which they are built, using both traditional and non-traditional methods. The Wright Lecture Series is sponsored by AIA Southwest Wisconsin, the Monona Terrace Community & Convention Center, and the Frank Lloyd Wright Wisconsin Heritage Program. Harmon’s lecture free and open to the public. For more information on the entire series, visit www.aiaw.org. Frank Harmon, FAIA, is a Professor in Practice at NC State University and was the 1995 recipient of the Kamphoefner Prize for Distinguished Design over a Ten-Year Period. He founded his firm, Frank Harmon Architect PA, in 1985. In 2010, his firm was ranked 13th out of the top 50 firms in the nation by Architect magazine, and was included in Residential Architect magazine’s “RA 50: The Short List of Architects We Love.” Harmon’s work has been featured in numerous books, magazines and journals on architecture, including Dwell, Architectural Record, Architect, Residential Architect and Environmental Design + Construction. For more information, go to www.frankharmon.com. All proceeds will go to AIA NC’s Building Fund. January 14, 2011 (RALEIGH, NC) – Frank Harmon, FAIA, principal of Frank Harmon Architect PA and Professor in Practice at the NC State University College of Design, will be one of the three featured guests for Triangle Modernist Houses’ “Appetite 4 Architecture” dinner on Tuesday, February 8th, beginning at 6:30 p.m. at 18 Seaboard restaurant in Raleigh. Proceeds from ticket sales to this dinner will go to the North Carolina Chapter of the American Institute of Architects’ (AIA NC) for its building. The AIA NC Center for Architecture & Design headquarters, designed by Harmon’s firm, is under construction now in downtown Raleigh. David Crawford, AIA NC’s Executive Vice President, and Steve Schuster, AIA, principal of Clearscapes, will join Harmon for the February 8th A4A dinner. 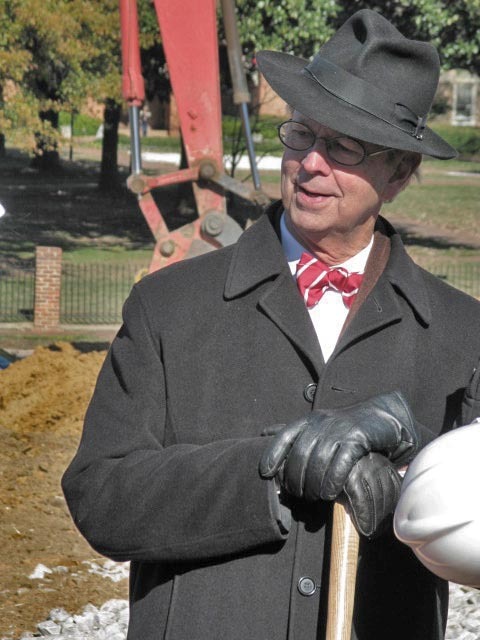 Steve Schuster helped lead the effort to secure financing for the new building. The official groundbreaking ceremony took place on December 9th. Tickets for the February 8th dinner at 18 Seaboard are $49 per person and include three courses (appetizer, entree, dessert) from a pre-selected menu plus coffee/water/tea, tax, and gratuity. Vegetarian options are also available. Ticket reservations are available at www.trianglemodernisthouses.com/a4a.htm. For more information on Frank Harmon, FAIA, visit www.frankharmon.com. For more information on TMH’s series of Appetite 4 Architecture dinners, visit www.trianglemodernisthouses.com. Frank Harmon, FAIA, is founder and principal of Frank Harmon Architect PA, a multi-award-winning firm in Raleigh that is recognized nationally as a leader in innovative, modern, and regionally appropriate “green” architecture. Professor in Practice at NC State University’s College of Design, Harmon is a sought-after speaker at AIA and other conferences and events, and was the only North Carolina architect included in Residential Architect magazine’s recent “RA 50: The Short List of Architects We Love.” The year Harmon’s firm was ranked 13th out of the top 50 firms in the nation by Architect magazine, an annual rating that emphasizes ecological commitment and design quality as much as profitability. 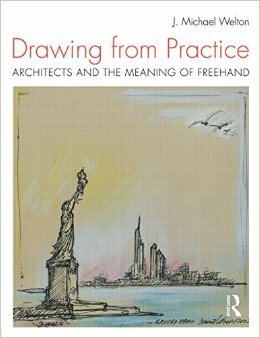 His work has been featured in numerous books, magazines and journals on architecture, including Dwell, Architectural Record, Arch Daily, and Residential Architect. For more information visit www.frankharmon.com.